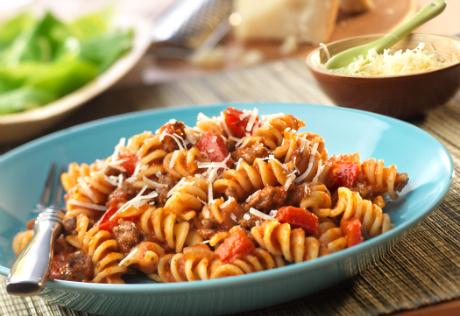 This Italian-style skillet pasta dish features sautéed ground beef and onion combined with a savory tomato sauce, rotini pasta and Parmesan cheese. It’s got kicked up flavor that will have your family begging for more! Cook the beef, onion and pepper in a 12-inch skillet over medium-high heat until the beef is browned, stirring often to separate meat. Pour off any fat. Stir the sauce and rotini in the skillet and cook until the mixture is hot and bubbling, stirring occasionally. Serve with the cheese.